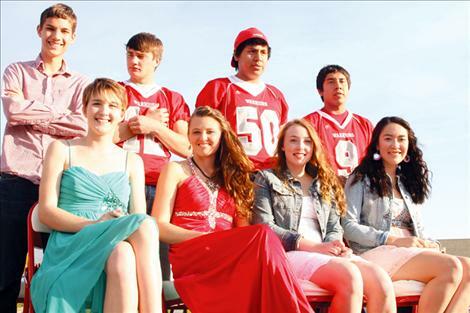 Arlee students show school spirit for homecoming festivities. Arlee Homecoming royalty from back, left are: Parker Holz, King Riley Rogers, Chance No Runner Brazill, PJ Haynes; front: Katelyn Revis, Alex Adams, Amelia North, and Queen Violet Pablo. 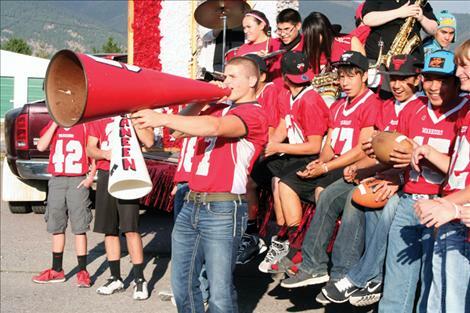 ARLEE – Students at the Arlee School District pushed school spirit to a new level this year during homecoming week by having a parade. It was hard for folks to remember the last time there was a homecoming parade - some estimated about 25 years. “Our school is amazing and we wanted to be more spirited,” said high school junior Isaac Desjarlais. As a football player, Isaac rode on one of the three floats during Friday’s parade with his team and the cross country team. Freshman Rory Bird played a trombone with the school band from the first float. The volleyball team rode on the third float with balloons and stuffed tigers. Junior high school secretary Melinda Pablo followed the parade route driving a riding lawnmower pulling a wagon with three children. During the week, students dressed up to show school spirit including a day of super heroes and hall decorating. The town got into the spirit by painting windows with red and white designs. Katelyn Revis, Parker Holz, Amelia North, Chance No Runner Brazill, Alex Adams and PJ Haynes were voted in by students as the homecoming royalty. Violet Pablo was crowned queen. Riley Rogers was voted king.